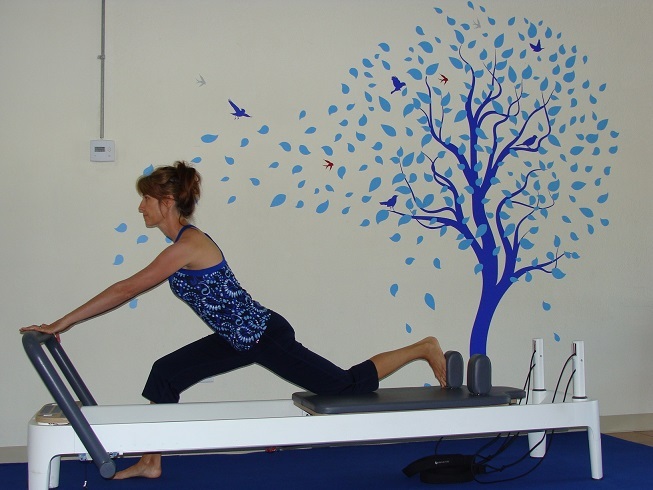 Pilates Reformer Exercises are great at enhancing both your strength and flexibility utilizing the spring tension. 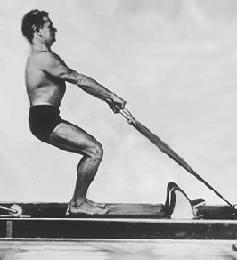 Just check out Joseph Pilates here using his invention the Reformer to do a Standing Pulling exercise on the Pilates Reformer. The great thing about this very innovative Pilates machine is that it uses spring tension so the body and joints are not weighed down by heavy dead weights. The Springs are great for both young and old joints as it opens, stretches, and strengthens the muscles around them so you feel energized after your workouts. Just look at Joe here in his 60's still young and spry! One of my favorite Pilates Reformer Exercises is the Eve's Lunge Stretch. This exercise helps to really stretch the hamstrings and hip flexors on oppositional legs, while strengthening the muscles around the knee joint. If you are like me and have had several knee surgeries or just have bad knees, then this is a great exercise to work the muscles that surround and protect it. Use a pad under your kneeling knee if you need to. I set the springs at 1 - 1 1/2 and then push out through the back leg first or open the carriage there until I feel the hip flexors stretch. Then push out with the leg and foot on the bar until you feel a stretch in the hamstring. Hold, and then bend the front knee slowing dragging the carriage in keeping the back leg extended open. 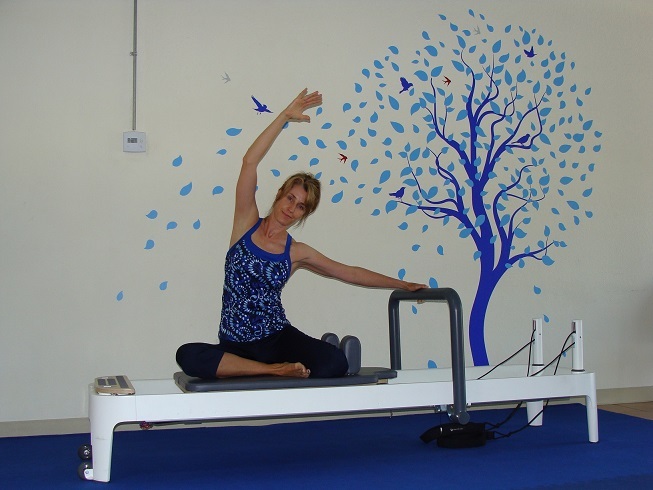 Check out this page to see my YouTube Pilates Reformer Exercises Videos! The Pilates Reformer Side Stretch, otherwise know as the "Mermaid" is a great way to stretch the lats along the side of the spine and to help improve your posture. Line yourself up for the Pilates Mermaid on one side with your legs folded as shown or, if your hips won't allow you can dangle your legs over the edge of the Pilates machine. I set the spring tension on 1 red spring. Press the carriage out with the hand on foot bar extending the other arm with an inhale. Then, exhale as you bend from your ribcage keeping your sitting bones reaching down moving the carriage out a bit farther. Really feel this stretch in your waist and oblique muscles along your sides. Inhale reaching back up and exhale as you pull the carriage back in with. Repeat for 6-8 repetitions on each side working for more stretch on each push. * Keep space between your ribs and hips on each side as you bend. This is one of the Pilates Reformer exercises that doesn't get much attention. This work is not as common as regular footwork, but it really targets the seldom used hip abductors that are important in daily activities and to keep the hips strong and mobile. Begin lying on your side with hips and shoulders stacked on top of each other. Extend your bottom leg under the foot bar and place your top foot on the bar angled slightly turned out. Inhale as you push out extending the top leg and then exhale as you return keeping the bottom leg lifted and long so you don't hit any part of the Pilates machine coming back in. You can chance your foot position on the bar to a turnout or straight parallel foot. Repeat for 10-20 repetitions on each side. 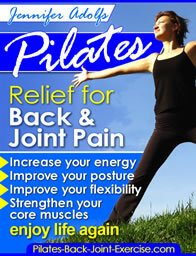 Leave Pilates Reformer Exercises and check out more of the Pilates equipment exercises here.